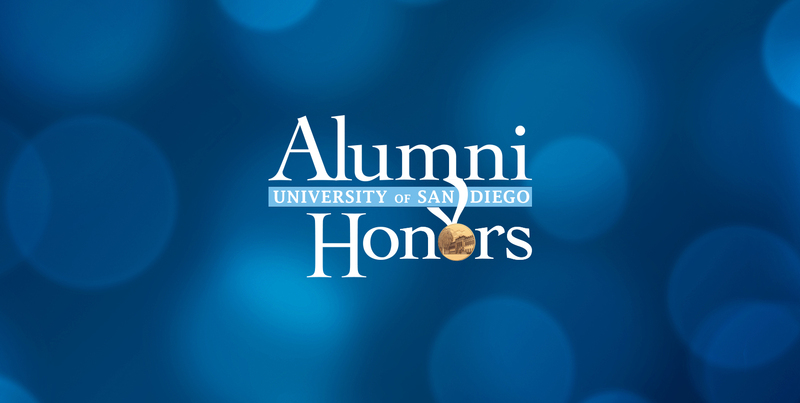 Ten of USD’s most extraordinary alumni were celebrated on April 28 at the 2018 annual Alumni Honors event. 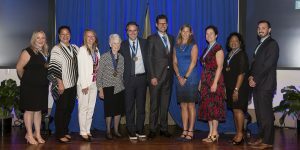 Recipients were recognized for volunteer service, contributions to humanitarian causes, athletic excellence and outstanding career achievement. Sister Virginia Rodee, RSCJ, ‘57 (BA), ‘74 (MA), who recently retired as assistant vice president for mission and ministry, was awarded the Mother Rosalie Clifton Hill Award, presented to a university alumnus who personifies the spirit and philosophy of the University of San Diego. Tracy Reines ‘94 (BA) received the Bishop Charles Francis Buddy Award, presented to an alumnus in recognition of his or her extraordinary contribution and commitment to humanitarian causes. Reines is regional director for U.S. programs for the International Rescue Committee. Sue Snyder, Women’s Volleyball head coach from 1990-98, was inducted into the Chet and Marguerite Pagni Family Athletic Hall of Fame. Since she retired from coaching, Snyder has continued to play volleyball nationally and internationally. John Della Volpe ‘89 (BA) was honored by the College of Arts and Sciences. He is director of polling for Harvard University’s Institute of Politics and founder and CEO of SocialSphere, Inc. He has been described as one of the world’s leading authorities on understanding global sentiment, opinion and influence, especially among millennials and in the age of digital and social media. Cindy Steckel ‘10 (PhD), RN, NEA-BC was selected by the Hahn School of Nursing and Health Science. She is vice president and chief nursing and operations executive for Scripps Memorial Hospital. She passionately embraces what the hospital calls “value by design” and is committed to steering Scripps La Jolla in the direction of continuous improvement. Eleonora-Markella Mantika ‘06 (MA) is the honoree of the Joan B. Kroc School of Peace Studies. She is political affairs/liaison officer for the United Nations Verification Mission in Colombia and has been working in the field of democratic governance, mine action and rule of law, and security institutions since 2010. William “Bill” Brennan ‘96 (BBA) was honored by the School of Business. He is principal for the Marsh & McLennan Agency and co-founder of the Daisy Miracle Brennan Foundation. He specializes in the placement of property and casualty and workers’ compensation programs for large to middle-market companies across the country. Vickie E. Turner ‘82 (JD) was selected by the School of Law as their honoree. She is a partner at Wilson Turner Kosmo LLP and has earned national recognition defending complex product liability cases throughout California and in 12 other western states. Among her many accomplishments, she is the co-founder of the Turner Dream Foundation and the Links to STEM Program. Catherine “Caity” S. Riddle Meader ‘10 (MA) is the honoree for the School of Leadership and Education Sciences. She is executive director for Family Services of Tulare County. The domestic violence agency serves more than 3,000 individuals annually, providing parenting resources, mental health counseling, sexual assault services, supervised visitation and supportive housing. Rasheed Behrooznia ‘02 (BS/BA) was selected by the Shiley-Marcos School of Engineering. He is vice president of engineering for Cubic Transportation Systems, where he leads all engineering for North America. His team designs and develops fare-collection systems for mass transit in some of the biggest and most iconic cities around the globe. Shown above from left to right: Catherine “Caity” S. Riddle Meader ‘10 (MA); Tracy Reines ’94 (BA); Eleonora-Markella Mantika ‘06 (MA); Sister Virginia Rodee, RSCJ, ’57 (BA), ’74 (MA); John Della Volpe ’89 (BA); William “Bill” Brennan ‘96 (BBA); Sue Snyder; Cindy Steckel ‘10 (PhD), RN, NEA-BC; Vickie E. Turner ‘82 (JD) and Rasheed Behrooznia ’02 (BS/BA). Click here to see videos of each recipient.